A Flood Warning is in effect for parts of the D.C. area until 10 a.m. as the region cleans up from another round of severe storms that hit the D.C. area Tuesday night. Flash flooding covered several roads in Frederick County, Maryland, leading to multiple water rescues around the area. Here's what you need to know. The National Weather Service extended a Flood Warning for parts of Frederick County and Loudoun County until 10 a.m. on Wednesday, May 16. WASHINGTON — The Wednesday morning commute could be difficult as the D.C. area tries to clean up from a second round of severe weather that brought heavy flooding to areas like Frederick County, Maryland. The weather has caused MARC to suspend service on the Brunswick Line on Wednesday. MARC riders who want to use Metrorail as an alternative can show their tickets to a Metrorail station manager on Wednesday. MDOT MTA said they hope to have service fully restored on the Brunswick Line by Thursday. In Montgomery County, White’s Ferry has also closed due to high water. The National Weather Service has issued a Coastal Flood Advisory for the shoreline in Arlington County and the city of Alexandria until 11 a.m. It also extended a Flood Warning for parts of Frederick and Montgomery counties in Maryland and Loudoun County in Virginia until 10 a.m.
A Flood Warning for parts of Washington County in Maryland and Jefferson and Berkeley counties in West Virginia expired at 6 a.m. The warning means people should avoid flooded roads, especially during the early hours as the lack of light could make it difficult to recognize flooded areas. Storm Team 4 meteorologist Matt Ritter said that while worst appears to be over for now, flooding is still a major concern. Ritter said parts of Frederick County received as much as six inches of rain in the time span of three hours on Tuesday night. Closer to D.C., Storm Team 4 meteorologist Sheena Parveen said BWI-Marshall Airport recorded 1.63 inches of rain on Tuesday while Reagan National Airport recorded .41 inches and Dulles International Airport recorded .27 inches. The Washington Nationals suspended their Tuesday night game against the New York Yankees because of the weather. Their game resumes 5:05 p.m. Wednesday, but Ritter said it is possible the Nats will still have to deal with delays on Wednesday night. All this comes as the area is trying to clean up the damage from thunderstorms Monday night that brought strong winds, heavy rain and damage throughout the region. While rain is still in the forecast for Wednesday, the good news is the weather is not expected to be as bad as it was on Monday and Tuesday. “It looks like for the short term, if there’s any commuting problems from the flooding, it’s just from what has already fallen, it’s not going to be from what is going to fall from the clouds over the course of the next couple of hours,” Ritter said. Wednesday will also be a lot cooler than Tuesday with temperatures in the 70s, but it will still feel humid. Ritter said the cool down should help prevent more severe storms from developing in the days ahead. The National Weather Service has issued a Flood Warning for northwestern Montgomery County until 10 a.m. It also extended a Flood Warning for southwestern Frederick County in Maryland and northeastern Loudoun County in Virginia until 10 a.m. The National Weather Service said some of the areas that might experience flooding include Ballenger Creek, Brunswick, Adamstown, Lovettsville, Buckeystown, Rosemont, Petersville, Doubs and Park Mills. A Flood Warning for Southeastern Washington County in Maryland and east central Jefferson County in West Virginia was set to expire at 6 a.m. Flood Warnings for parts of Anne Arundel, Howard and Baltimore counties in Maryland expired at 6 a.m. on Wednesday. The National Weather Service said the flood waters had receded and were no longer expected to pose a threat to life or property, though there may still be some road closures. On Tuesday night, Frederick County, Maryland, saw some heavy flooding around the area. Police in the city of Frederick asked drivers to stay off roads because many roads were not passable. A list of the roads closed in Frederick County can be found on the county’s website. The county also experienced a Flash Flood Emergency. Before 9 p.m., emergency management officials had reported severe flooding with multiple water rescues around the area. Parts of Loudoun County, Virginia, also experienced flooding late Tuesday night with some road closures due to high standing water. Earlier Tuesday, several roads were blocked in Fairfax County, Virginia, due to storm-related damage. The rain will continue throughout the rest of the week. “We’re looking at more of a rain-day type of pattern as tropical moisture will begin to stream in from Florida and the Caribbean, riding along a stationary front, which will be situated across the area for days,” Storm Team 4 meteorologist Sheena Parveen said. “This will leave us in quite the rainy pattern Wednesday through Saturday, with nothing to push it along,” she added. On Wednesday, the temperatures will get into the upper 70s with scattered showers and thunderstorms possible. Things will cool down slightly on Thursday as temperatures are expected to be in the mid-70s with scattered showers and thunderstorms possible. Friday and Saturday should be similar to Thursday, with temperatures in the mid-70s and — you guessed it — scattered showers and thunderstorms. The area will finally get a break on Sunday. It is expected to be partly to mostly cloudy with temperatures in the low 80s. As of 6:45 a.m. on Wednesday, there were slightly less than 2,000 customers without power in the D.C. area. 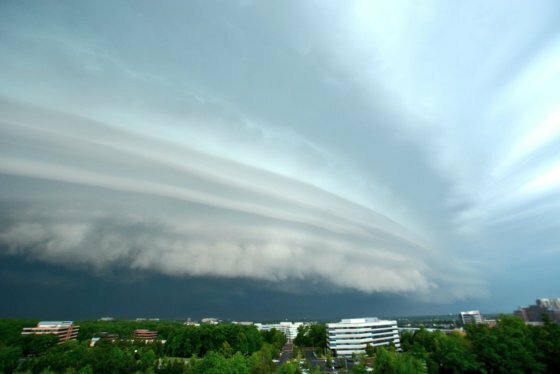 Severe thunderstorms barreled through the D.C. area Monday evening, bringing strong winds and heavy rains. See photos of their impact around the area.